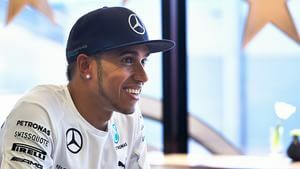 This week, the drivers settled in very quickly at Hockenheim to complete the tenth round of the F1 season. Off track, they were just as busy with dancing, singing, showing us round the motorhomes, apologising, getting into trouble with the fans, and fashioning as many burgers as possible in a given amount of time. It can only be Germany! As always, your help is invaluable to making the rankings what they are. It might be name on the top but I love and consider each and every suggestion that comes my way. Do send yours via the comments or Twitter, and you'll get to see your name up in lights too! +1 Daniel Ricciardo: Admitting his own rather terrifying serial-killer look in the latest edition of F1 Racing. +3 Lewis Hamilton: Doing Michael Jackson's anti-gravity lean, with a handy wind tunnel to help out. +2 Daniel Ricciardo: Having a bit of a dance in front of a... tough crowd! +2 Lewis Hamilton: Nice little tour around the Mercedes motorhome, bit cheeky with Nico Rosberg as always! +2 Nico Hülkenberg: Taking his team out for karting and a barbecue. Even off duty, drivers like to drive! +1 Daniel Ricciardo: Showing us his engineer isn't completely grumpy, after he managed to contain any kind of smile with Daniel's dancing. +1 Kevin Magnussen: Not choosing between waffles and pancakes, but instead pondering the ultimate dessert. +2 Kamui Kobayashi: Sabotaging the cameraman whilst they are busy minding their own business in the Caterham garage. +2 Nico Hülkenberg: Taking part in a slightly gross but fun build-a-burger competition at Silverstone. And winning! +1 Nico Rosberg: A very joyous Nico sings a very on-message post-race song. +2 Jenson Button: Proving again to be a nice, thoughtful honest chap with his post-Germany reflections on the incident with Lewis. +2 Sebastian Vettel: Doing his bit for the home crowd and abandoning the driver's parade to distribute goodies. -9 Sebastian Vettel: Reportedly being a bad representative for the sport of F1 and complaining so much that ticket sales were down in Germany.